How can I reuse or recycle plastic VHS video cases? | How can I recycle this? 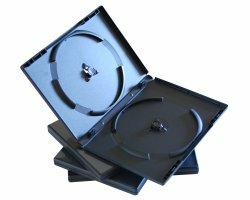 How can I reuse or recycle plastic VHS video cases? I have some old vhs tape cases. The cases are made of a plastic shell to hold the video that is glued to a cardboard outer layer with the artwork printed on it. I’ve pulled apart several of the cases and recycled the cardboard, but now I’m left with a stack of plastic shells (most with glue residue on the back). Is it possible to recycle this plastic? I don’t see any recycling symbols but I’d hate to just throw them away! There must be thousands and thousands of these things kicked about as people dumped their old videos. So any suggestions for recycling or reusing them? I use one as a paperback book holder when I travel. 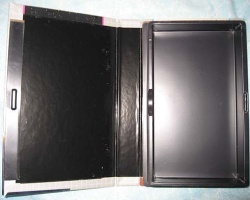 Stops the book cover form getting ripped and wrinkled in the suitcase. if its unmarked, store valuables in them in plain site, there really isn’t any money in vhs any more, so if your house was robbed. glue them shut for small children to use as blocks. Take them on a camping trip or boating trip, they’ll float and they’ll be water resistant. decorate them pretty and use them to “wrap” gifts in. store all your warrenties in them, they’re easy to file on a shelf. give them to kids for trinket boxes. fill them with beans, rice, etc, seal them and make instruments for kids. let kids make a “time capsule” bury it in your flower garden or yard. use it as an on the go jewelry box, they’ll keep every thing together in your suitcase. store small candles in them, great camping idea to keep the wicks dry. oh yeah, you could store pictures in them too. I used to use mine as pencil boxes! Toss them on the campfire – they make pretty colored flames!! If you have an olf-fashioned APS-camera, the cases make good containers for the film spools. I chick made a purse out of one once, i thought it looked pretty neat. If someone needs more of them, ask local Blockbuster. I’m impressed! I don’t think that I would have thought to use the tapes this way. How is it surviving the weather? I really like the added touch of one red cassette in the midst of all the black cassettes. Remove pages from an old book, and glue the cases inside the cover. You can hide valuables right on your bookshelf, and no one will suspect. Incidentally, I am looking to buy video cases for this very project. Want to sell some? Please contact me at bdcirkles@hotmail.com if you can spare about 10 cases. T.J’s Recycling which is owned by a young man who started his business when he was 11, takes the cassette and vhs tapes and re purposes them. 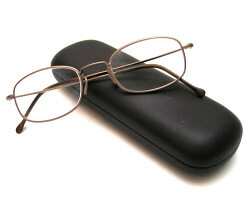 Check out the pics on BeGreenMinded.com or own the web site tjsrecycledproducts. They are in Va.
line with tracing paper, put some battery operated white lights in and use as a mini light box. great for writing on with dry wipe pens in early years settings! trace letters, numbers or use as a free drawing activity! Good ideas! I use an old VHS case to store my crochet hooks in. Small sewing notions would also fit in an old case. I want to recycle the actual videos with the tape in. Obviously I would remove the tape, then what. The ideas on the boxes are good though. Hi, if you are in the UK, try contacting Environmental Media Solutions, http://www.ems-europe.co.uk. There should be a form to download from their website and you can send up to 100 items free of charge but have to pay the postage. A carrier such as MyHermes might be cheapest. If you got many of those boxes, build small play house for a child. Connect boxes with duct tape. Jenny on How can I reuse or recycle … old dentures? Kevin Wood on How can I reuse or recycle old photographic slides? Kristina Cliff Evans on How can I reuse or recycle old photographic slides? Maya on How can I reuse or recycle (unused) sanitary towels & tampons? Elizabeth on How can I reuse or recycle cloth/woven plastic rice sacks? Andrew smith on How can I reuse or recycle … lots of sawdust/wood shavings? Kristina Cliff-Evans on How can I reuse or recycle old photographic slides? How can I use up old eggs? How can I reuse or recycle pistachio shells? How can I reuse or recycle fingernail clippings? How can I reuse or recycle charcoal ashes from my barbecue? How can I “repair” too runny/too solid homemade jam/jelly? 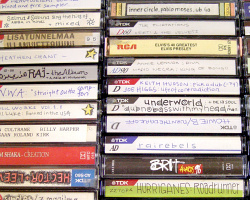 How can I reuse or recycle VHS video tapes? How can I reuse or recycle expired sunscreen/sun lotion? How can I reuse or recycle a wheelie bin? How can I reuse or recycle a wooden shoe rack? How can I reuse or recycle old glass blocks/glass bricks? How can I “reuse” fresh eggs that we can’t eat? How can I reuse or recycle toilet seats? How can I reuse or recycle empty bottled gas/propane cylinders? How can I reuse or recycle large (catering size) food cans? How can I reuse or recycle wallpaper samples? 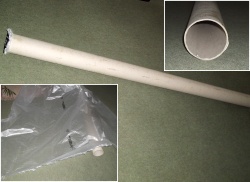 How can I reuse or recycle medical plastic tubing? What can I reuse or recycle as moulds for making new crayons from old ones? How can I reuse or recycle vertical blinds material?